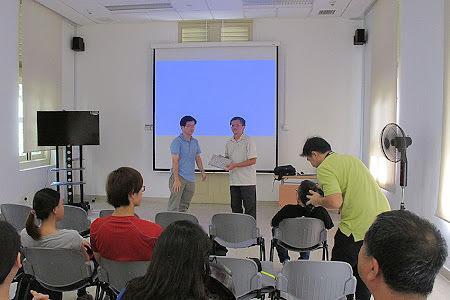 This morning, I had a sharing session with a group of staff from the National Parks Board. 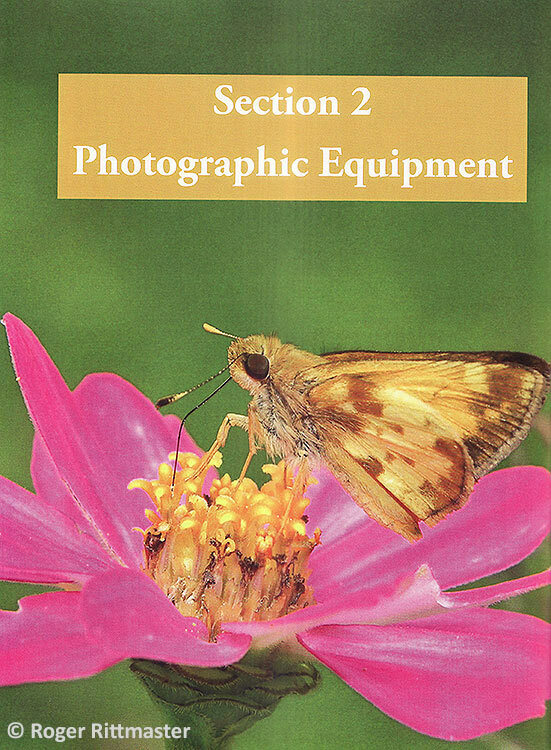 Most of the staff were from the Landscaping and Arboriculture and Streetscape East Branches of the Streetscape Division, National Biodiversity Centre Division and Community Parks. It was also an opportunity for me to learn a bit more about NParks' Nature Ways and how these are intended to enhance biodiversity in Singapore. 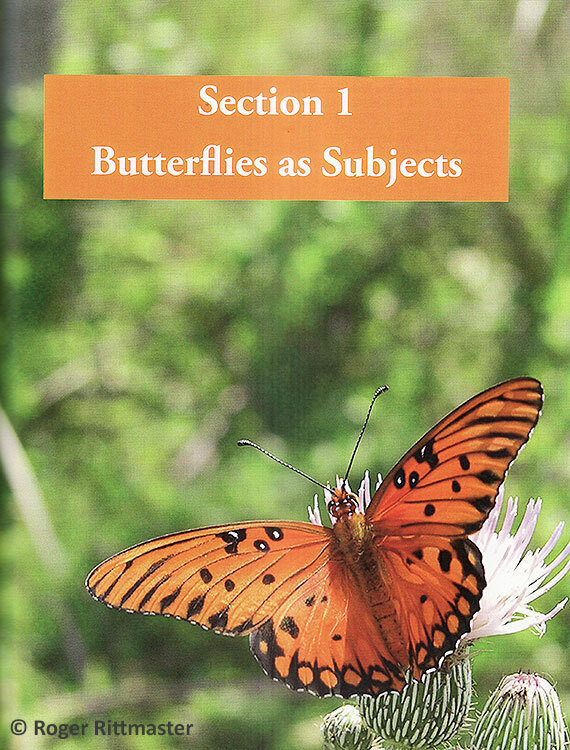 The morning started with a talk about butterflies, covering various aspects about their biology, ecology and habitats, their relationship with plants and designing and landscaping to attract butterflies. 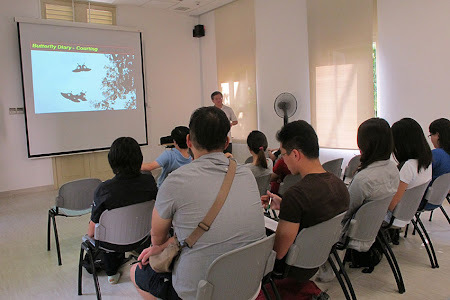 It was nice to see a very attentive audience, especially on a Saturday (an off-day for everyone!). 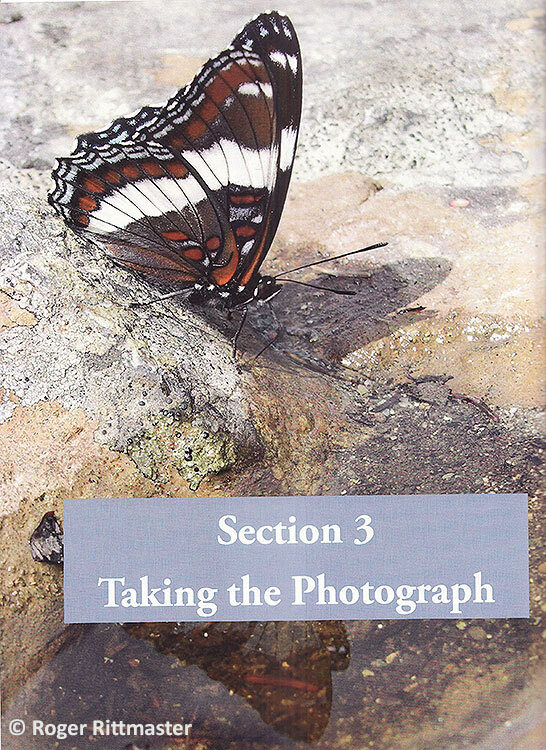 The staff asked very valid and relevant questions to enhance their knowledge about butterflies and how they exist in the environment. I was also pleased to note that many of the NParks staff had backgrounds in architecture, landscape architecture, urban planning, botany and arboriculture. I was glad that I had customised my talk to focus more on plants, landscape and how butterflies relate to plants, which was more relevant to my audience's areas of interest. 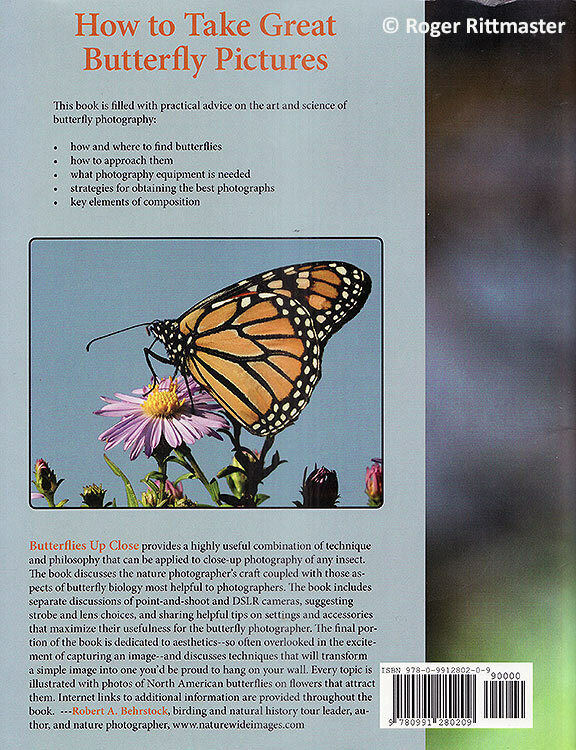 So what exactly are Nature Ways? 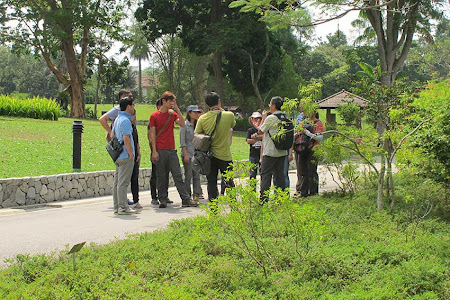 From NParks' Quarterly Newsletter, My Green Space, "Nature Ways are linear, green corridors along roadsides that have been developed to connect areas of high biodiversity to urban areas. The aim is to attract birdlife and butterflies from nature areas and parks to areas where people can appreciate them, and be more aware of the beautiful natural environment around them." 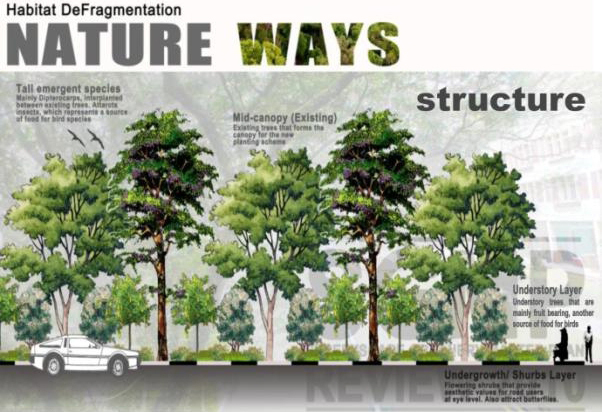 To create Nature Ways, NParks designs these eco-corridors to replicate the natural structures of forests as far as is possible. Trees, shrubs and groundcovers would be planted on available roadside planting strips to re-create habitats similar to those found in the emergent, mid-canopy, understory and undergrowth layers of natural forests. Relevant species of plants are then selected for the emergent, mid-canopy, understory and undergrowth layers to create conducive environments for birds and butterflies to encourage activities like nesting and feeding. In the understory and undergrowth layers, nectaring and host plants for butterflies are planted to attract various species like the Plain Tiger, Leopard, Mottled Emigrant and so on. 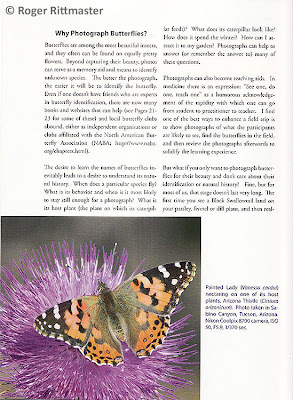 The group also had a discussion about doing a butterfly biodiversity survey that will help to fine-tune the species to attract to the various nature ways, depending on their locations and proximity to the source nodes of high butterfly diversity (e.g. 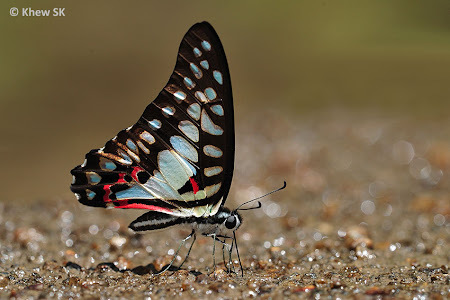 the nature reserves or larger parks) This is important, as it would then target the correct species and also helps with species recovery of the rarer species by increasing the host plants relevant to the specific location of the nature way. 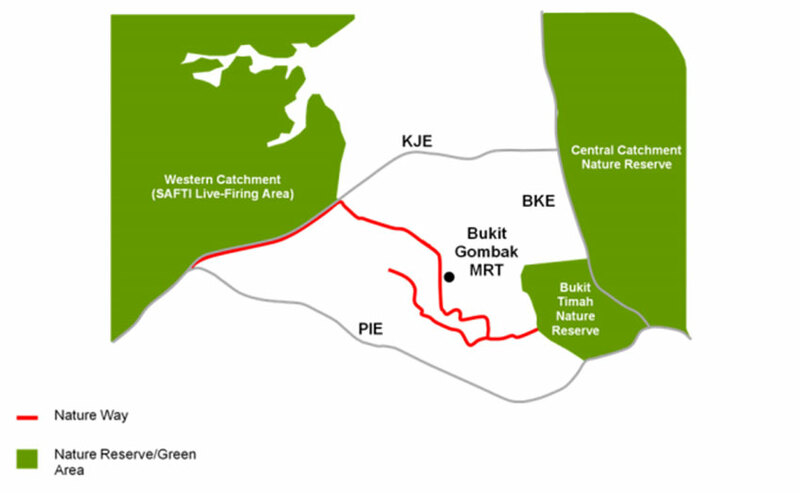 Currently, the longest nature way is the Tengah Nature Way. 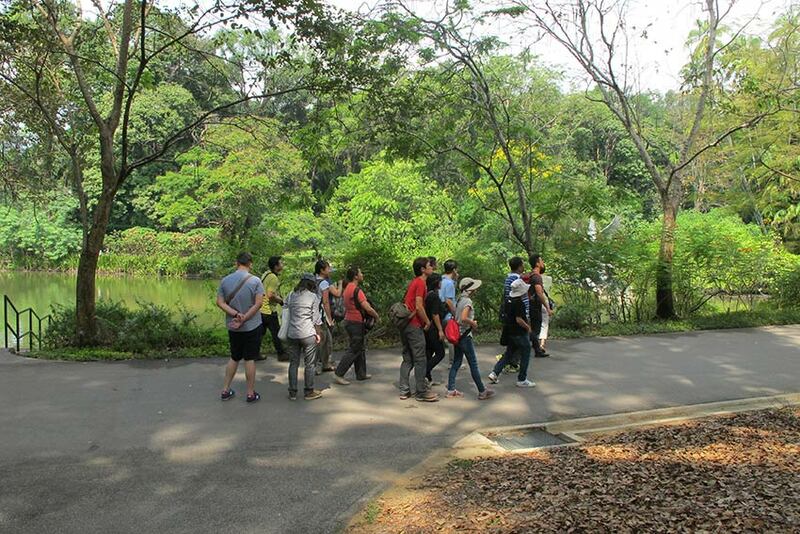 Spanning 13km in length, Tengah Nature Way is the Singapore’s longest Nature Way so far. It refers to the area of largely residential land between the Bukit Timah and Central Catchment Nature Reserves and the Western Catchment (SAFTI Live-Firing Area). 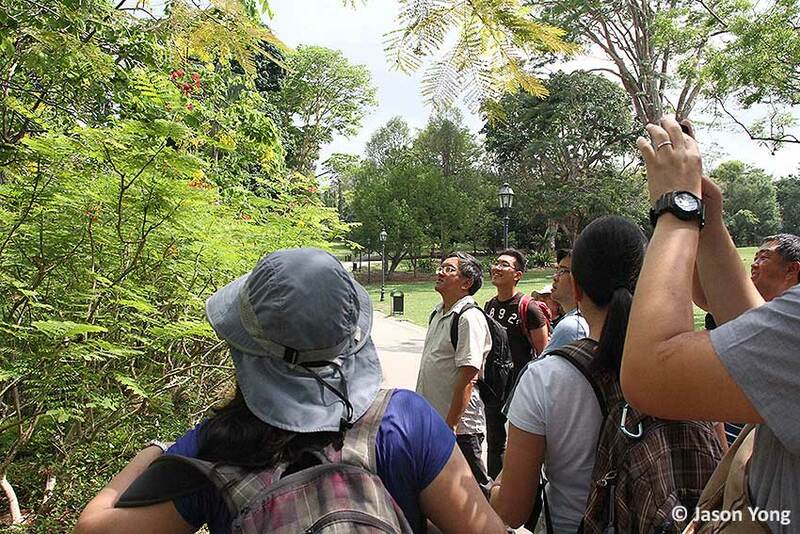 There are already nature ways at Admiralty, Kheam Hock, Tampines and Yishun. 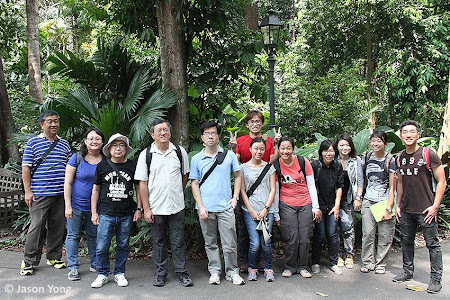 At the end of my talk, the group went on a short walk at the Singapore Botanic Gardens to see if we can spot any butterflies. We moved to the Swan Lake area, where there are more nectaring plants. At the edge of the pond, where a row of Cassia fistula and Caesalpinia pulcherrima were grown, a number of Pierid butterflies - Common Grass Yellow, Lemon Emigrant and Orange Emigrant were up and about. As if on cue, a female Orange Emigrant descended from the treetops and oviposited on a leaf of the Peacock Flower bush. 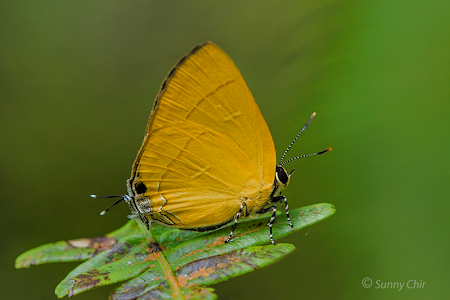 The Lemon Emigrants were also flying actively amongst the foliage of the Cassia fistula trees. 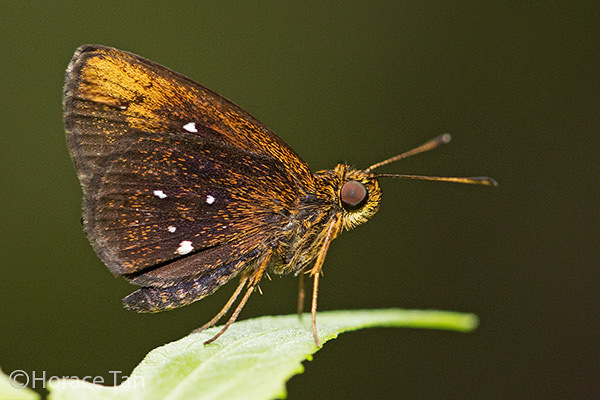 Walking further towards the Ginger Garden we spotted a number of Common Palmfly in the shaded area. 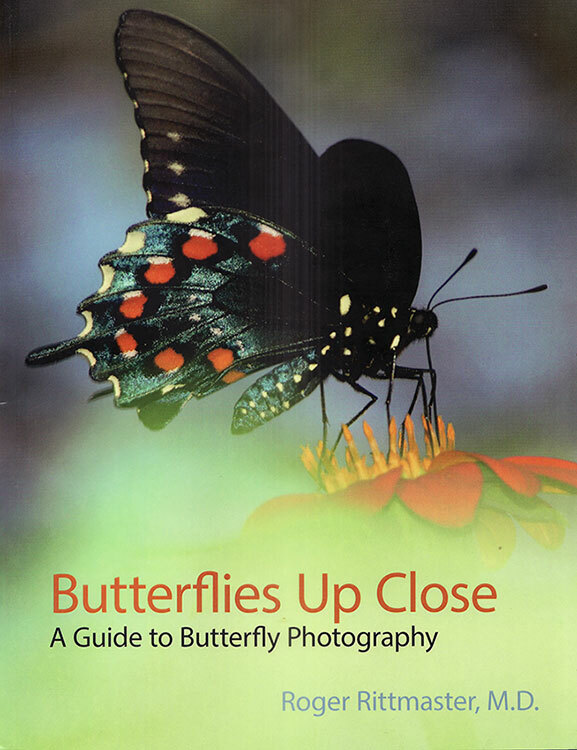 As the weather was hot and sunny, there were a number of butterflies up and about. 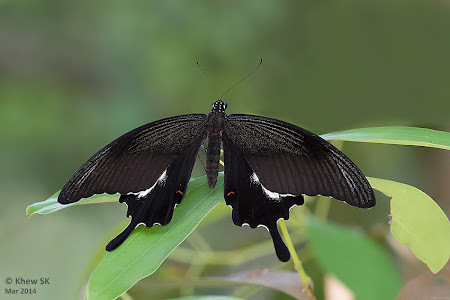 Over in the rainforest area, the group spotted species like the Painted Jezebel, a Common Mormon and a Short Banded Sailor. I was pleased to note that quite a few of the NParks staff were already quite conversant with butterflies and could capably identify the more common urban species. It will only be a matter of time and with more field experience that the staff can be competent butterfly guides in the nature ways and be able to educate visitors and members of the public on the butterfly diversity along the nature ways! 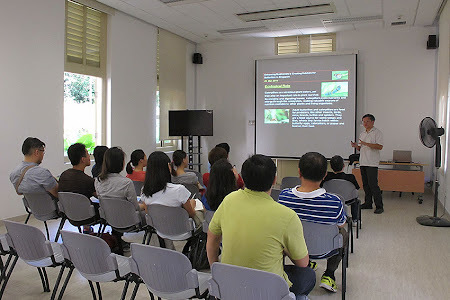 It was a worthwhile morning for me to share information about butterflies with the NParks staff and also learn more about the development of nature ways as a strategy to habitat de-fragmentation and conserving our precious biodiversity in Singapore. 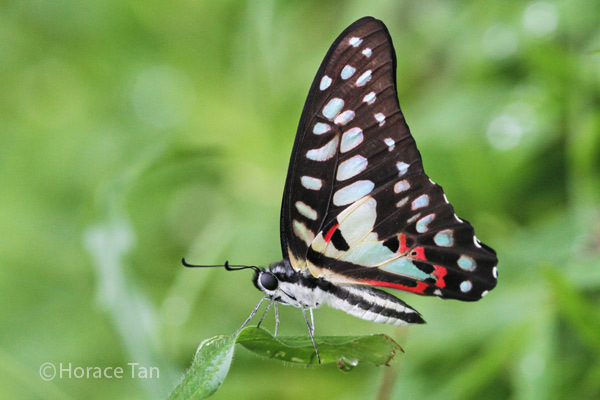 With 'customised' and selective planting relevant to the locations of the nature ways, these eco-corridors will no doubt help in creating a conducive environment for butterflies to move across the island as well as aid in species conservation in Singapore. 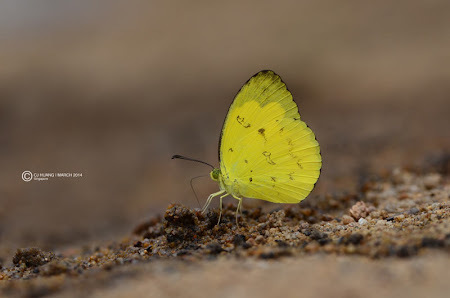 The Yellow Flash (Rapala domitia domitia) is one of the rarer species in the genus Rapala of which there are currently seven reliably identified species in Singapore. Though rare, the Yellow Flash appears to be regularly observed in the forested areas of Singapore, and is widespread in distribution. It is skittish and a fast flyer and quite averse to the camera's flash at times. The underside of the butterfly is a bright lemon yellow and largely unmarked except for a few black bars on the forewings and black marginal areas with blue iridescent scales on the hindwing. 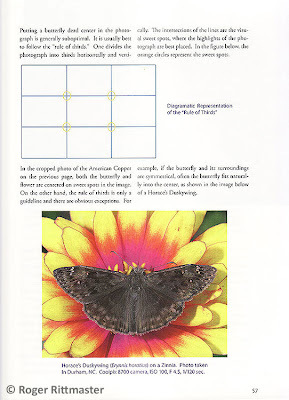 The upperside of both sexes is a dull brown. 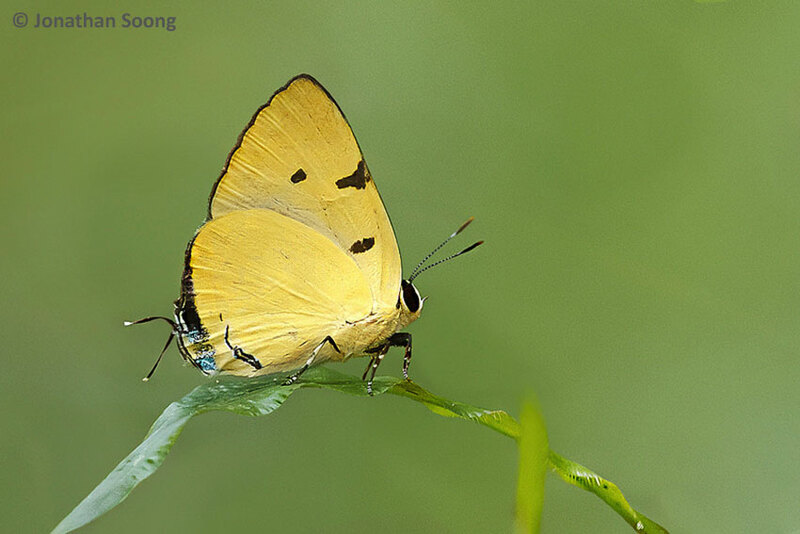 This pristine Yellow Flash was shot last weekend by young ButterflyCircle member Jonathan Soong. 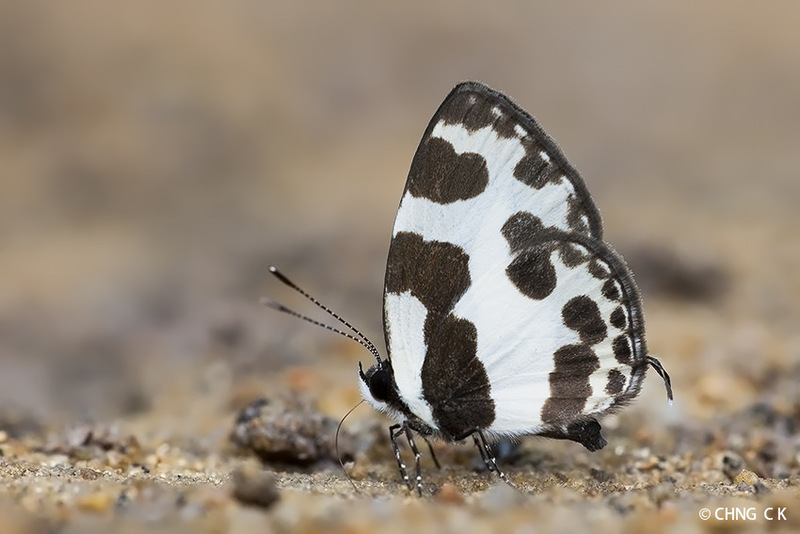 The male Horsfield's Baron is territorial, and often displays a behaviour where it perches on a few preferred vantage points and then fly out to "attack" anything that intrudes into its territory. The characteristic dark brown/black wings with a light blue marginal border across both wings up to the termen of the forewing sets it apart from most butterflies in Singapore. 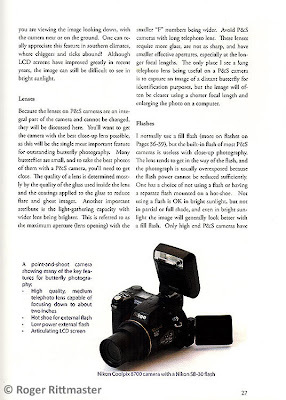 Beginners, however, often confuse this species with the male Archduke & Black Tipped Archduke, which are larger and feature a more robust body. 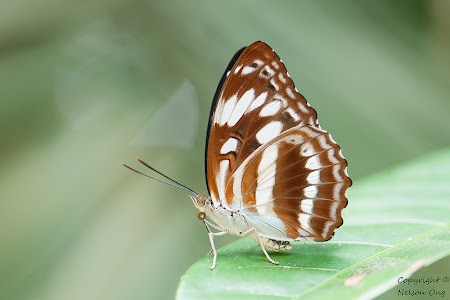 The underside of the Horsfield's Baron is pale buff with light brown markings. Male Horsfield's Barons are seldom encountered puddling or feeding on fallen fruits in the forest. 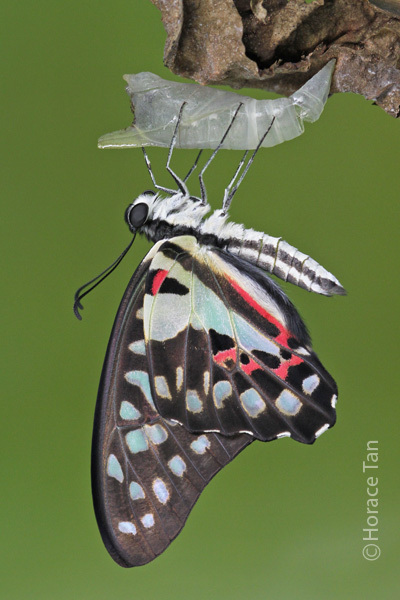 ButterflyCircle member Loke PF's shot is one such instance where this male was so intent on feeding on what appears to be a rotting fruit that it stayed in the same position for a long time. This Hairstreak is typical of the "Blues" in the family Lycaenidae that has many lookalikes that are challenging to identify, especially if the butterfly is flying erratically and does not stop for an observer to look for the distinguishing characteristics of each species. 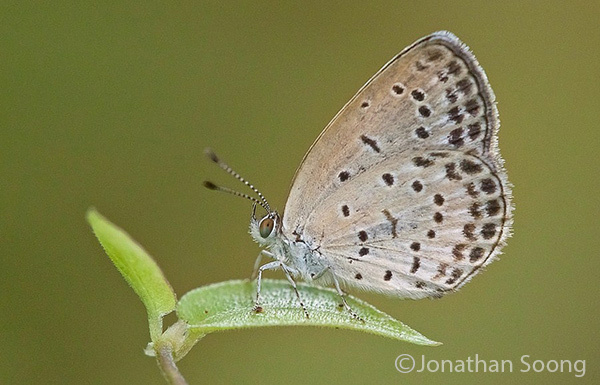 The Forget-Me-Not often flies in the company of its close cousin, the Silver Forget-Me-Not (Catochrysops panormus exiguus) and separation of the two can be challenging in the field. The Forget-Me-Not is moderately rare, and often encountered singly. It frequents open sunny areas with low vegetation. 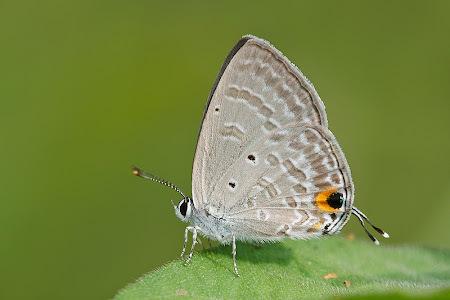 The male is lilac-blue above whilst the female has broad black apical borders on the forewings and more heavily shaded markings on submarginal area of the hindwing. The underside is pale buff with the usual streaks. 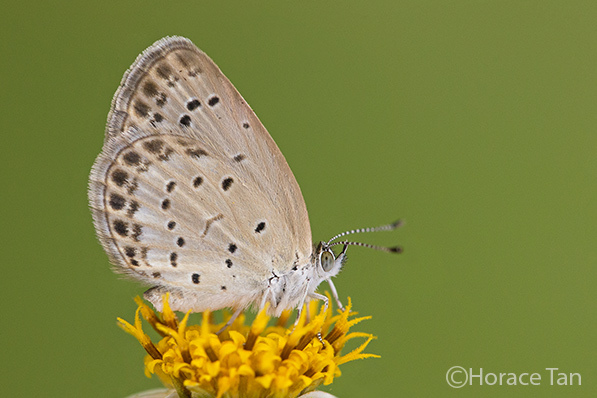 The distinguishing costal spot, which is placed midway between the cell spot and the post-discal fascia on the forewing separates this species from the Silver Forget-Me-Not. 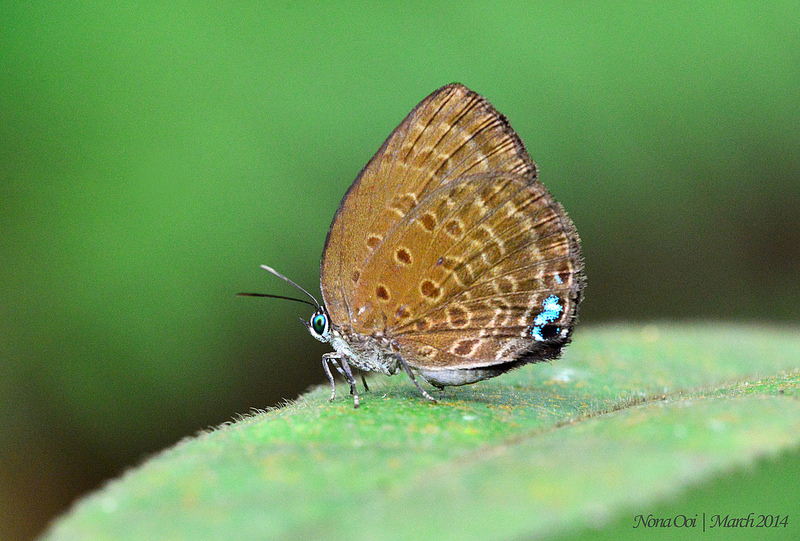 This individual, perched on a leaf, was shot by young ButterflyCircle member Jonathan Soong. It has been an interesting start to the first few months of 2014 ever since the cold and wet months of 2013, where Singapore had to struggle with flash floods and an over-abundance of water everywhere. Then suddenly, the North East monsoon winds dried up, starting in mid January, all the way through February and March. The weather swung from too much rain in November and December 2013, to dry and parched days that saw previously green fields and verdant vegetation turn a sickly brown all over Singapore. The National Environment Agency's website recorded day after day of fair sunny weather and after more than a month with virtually no rain, we've moved from worrying about flash floods to worrying about whether the government would start water rationing. Reservoir levels began to drop alarmingly, as with many ponds and water features all over the island. 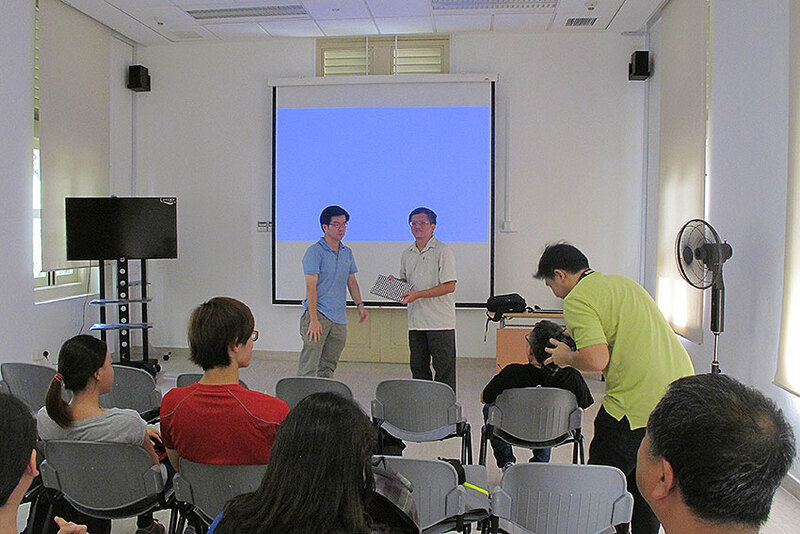 It was reported that over the past six weeks, a paltry 0.2mm of rain was recorded last month at Changi climate station. This is the least rain that has fallen since 1869!, and is well below the previous record of 6.3mm recorded in February 2010 and the mean February rainfall of 161mm. 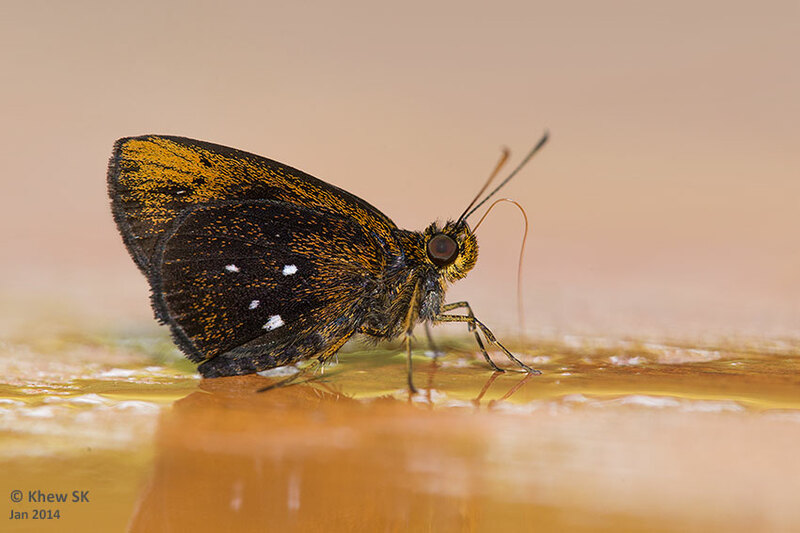 Interestingly, although the urban butterfly population suffered quite drastically as a result of the parched vegetation and plants, the forest butterfly population did not seem to be affected much. Strangely, over the past few weekends, ButterflyCircle members have spotted a higher diversity of butterfly species within the forested nature reserves, with some rare ones making their appearance all of a sudden. It would be interesting to have a reason for this strange phenomenon, but we have none to postulate at this present moment. Social and mainstream media were abuzz with the news of the mysterious disappearance of Malaysian Airlines Boeing 777 flight MH 370 en route to Beijing from Kuala Lumpur, with 239 passengers and crew on board. On 8 March, the plane took off from Kuala Lumpur on a standard scheduled flight to Beijing. That it suddenly disappeared without a trace over the sea somewhere between Malaysia and Vietnam is something that continues to stump the experts. A multi-national search effort involving many countries over the past week turned up nothing so far. A whole range of theories and speculations swamped the media - from pilot suicide to terrorist attack, hijacking and plane malfunction. But no wreckage nor any evidence has been found thus far. Latest news suggest that the plane's transponder and communications has been intentionally switched off, pointing to an "inside job" and someone who is technically conversant with avoiding civilian radar and rendering the plane "invisible" to all but military radars. This alludes to a hijacking of some sort, but until the facts are established, even this theory remains speculatory until someone claims responsibility for it. No matter what the reasons are for the disappearance of the plane, we must remind ourselves of the agony and grief of the families all the 239 passengers on board MH 370. Lots of unanswered questions add to the ever-increasing anxiety of these families, who have feared the worst for their loved ones. 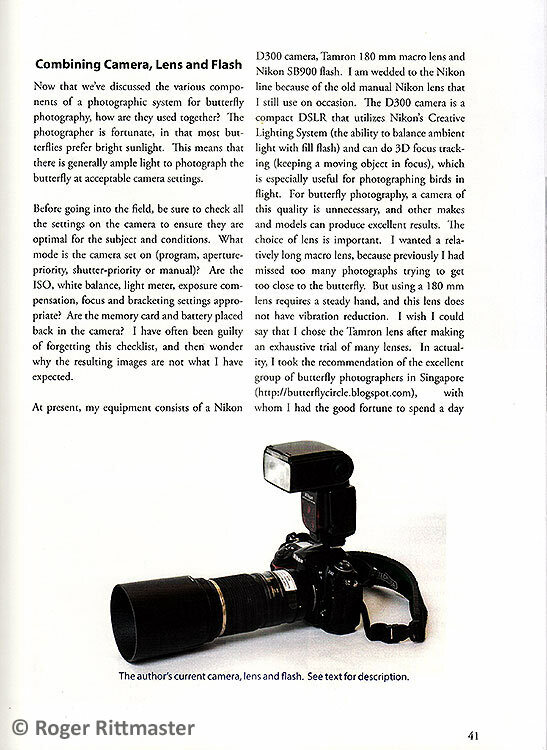 When will the answers come? How is it that no one can explain why something as huge as a Boeing 777 with 239 people on board, can disappear without a trace, with all the fancy technology and electronic gizmos that our generation is endowed with? Let us hope that we will know soon, and that there is still hope for the unfortunate 239 on flight MH 370. 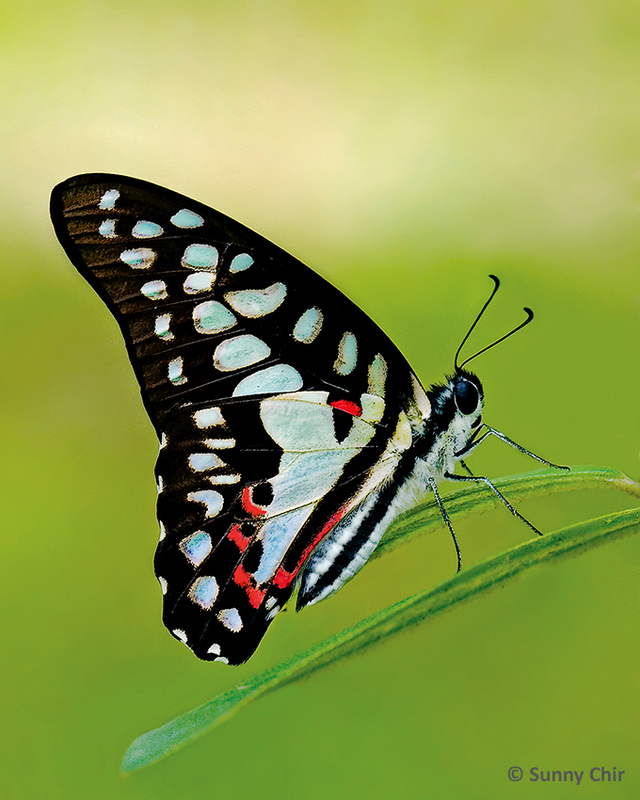 This month, we feature a butterfly that was recently discovered in Singapore. 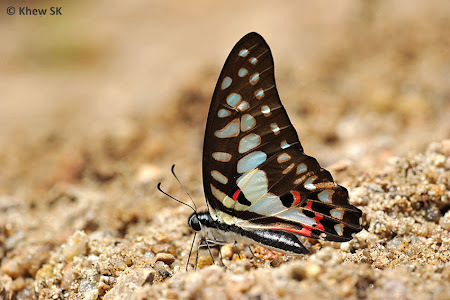 First seen on Pulau Ubin some time in March 2004, it regularly appears and is resident on Pulau Ubin. On the main island of Singapore, another individual was spotted at an urban hill park some time later in late 2006. 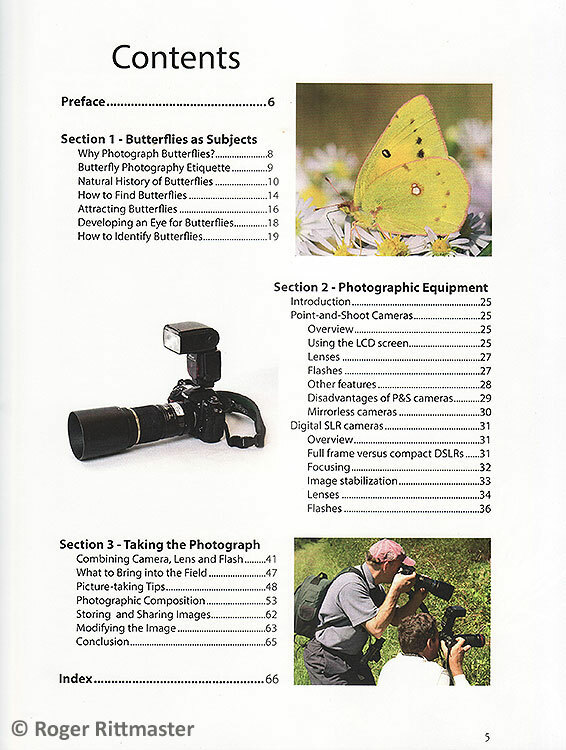 After close observation of the species, the early stages of the Common Jay was recorded by Horace Tan and documented in detail here. 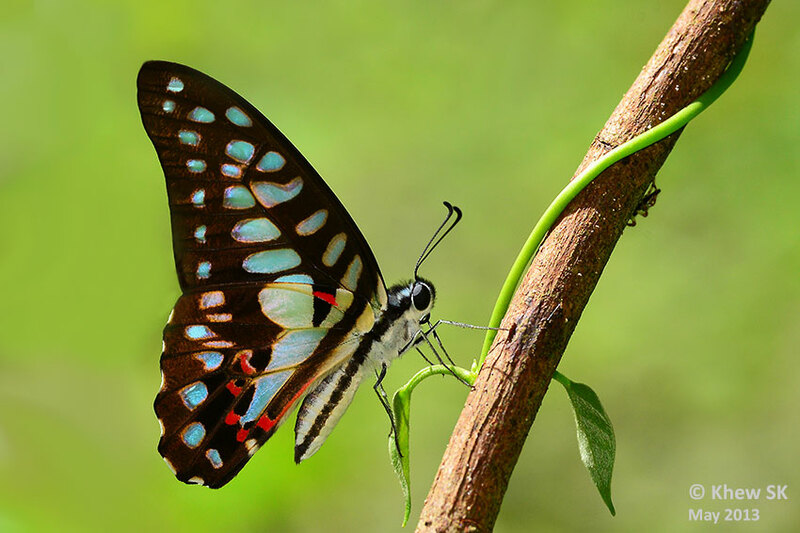 The caterpillar host plant that an egg-laying female was discovered ovipositing on Pulau Ubin, is Desmos chinensis (Dwarf Ylang Ylang). 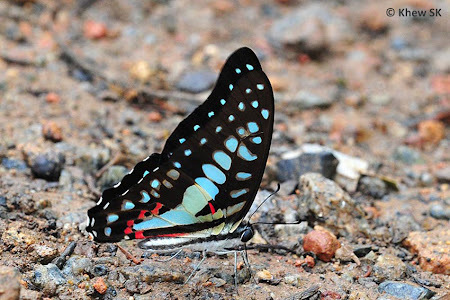 As the caterpillar host plant is not uncommon in several locations on Pulau Ubin, the Common Jay continues to survive as an extant species on Ubin to this day. 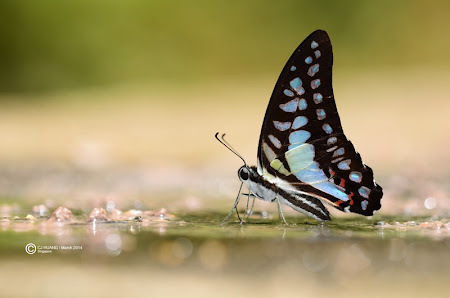 The Common Jay is one of several lookalike butterflies of the Graphium genus. 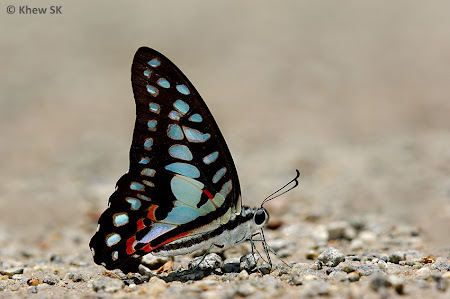 Over in Malaysia, there are at least five "Jays" which are basically blue in colour with black margins. We have only two in Singapore - the Blue Jay (Graphium evemon eventus) and the Common Jay (Graphium doson evemonides). The Common Jay is fast-flying, like the other species in the genus, and is often seen flying erratically along open paths and also at treetops. 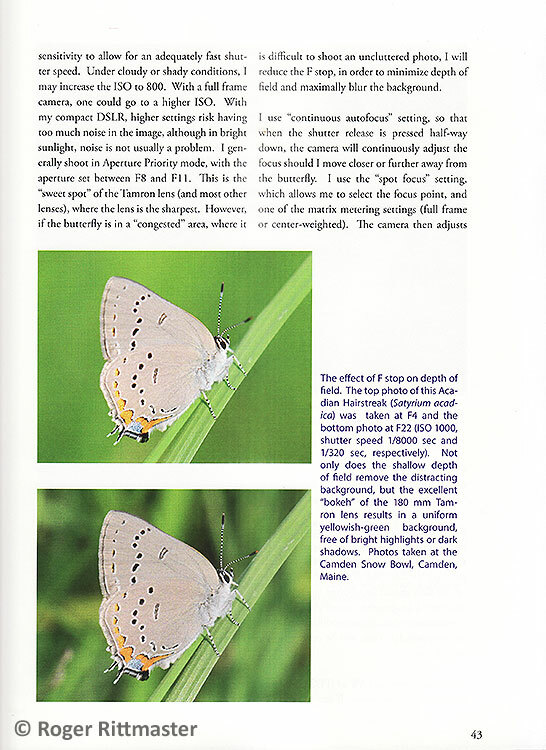 The wings are black above with a blue macular band across both wings. There are sub-marginal blue spots on both wings. 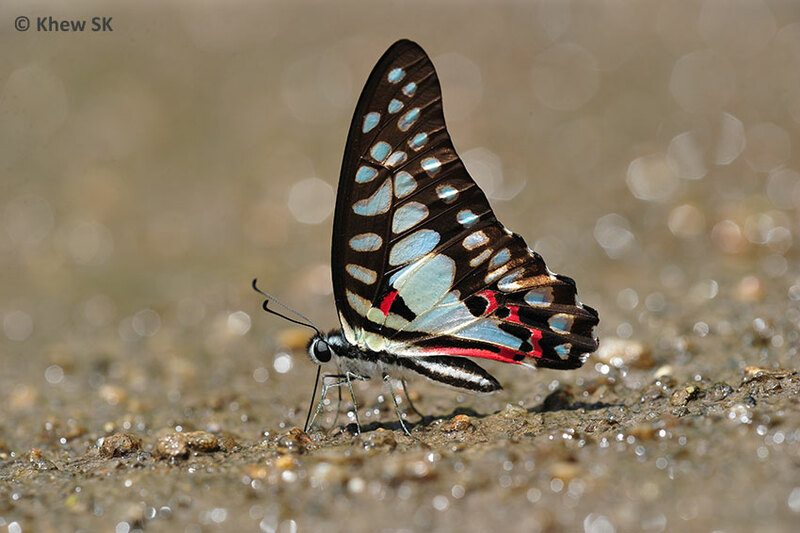 The distinguishing feature of the Common Jay is the dark, red-centred costal bar which is separated from the inner and distal black bars. Its status in Singapore can be considered endangered, due to the very localised occurrence on Pulau Ubin. 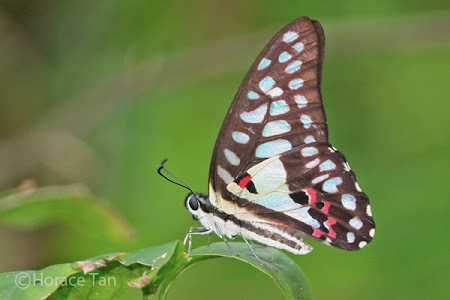 Although the species is common in Malaysia, it has not yet become as widespread on the main island of Singapore, where only one reliable sighting has been recorded thus far. 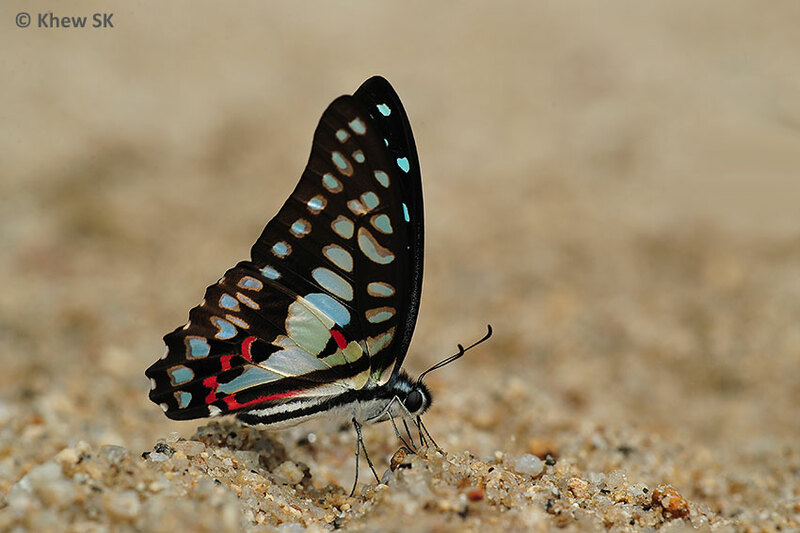 This means that its existence is limited to only Pulau Ubin at the moment, and is critically dependent on the availability of its main caterpillar host plant, Desmos chinensis for its continued survival on the island. 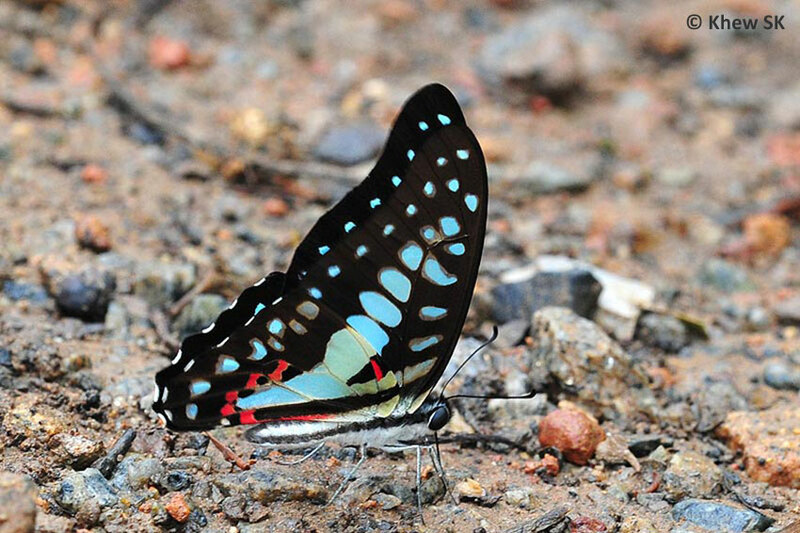 The Common Jay was not recorded by the early authors and hence taken as a new discovery for Singapore. 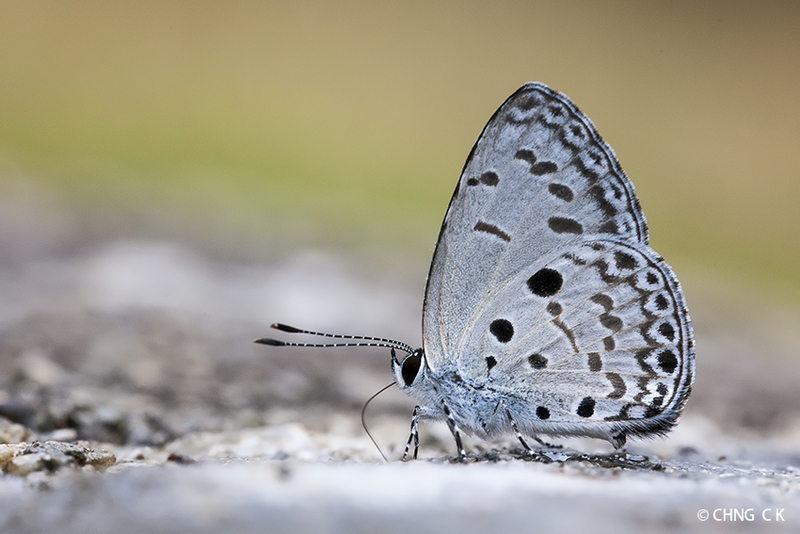 Despite being an endangered species, it has regularly been observed on Pulau Ubin and it is hoped that there will be no significant developments in the near future that would wipe the colony out. 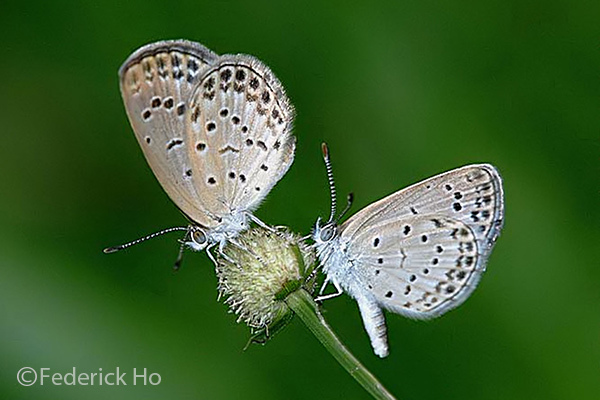 The Common Hedge Blue is a widespread Lycaenidae that is moderately common in Singapore. It is often encountered within the nature reserves of Singapore, but is also regularly encountered in urban parks and gardens. 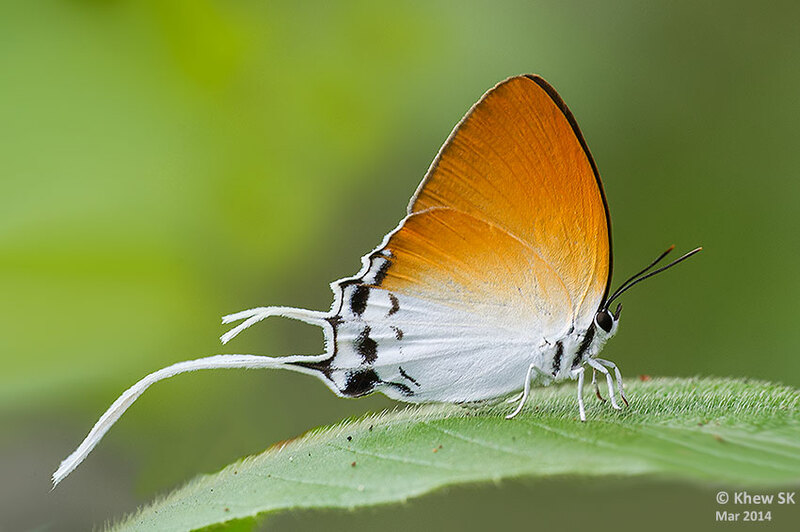 It has a strong erratic flight, but often returns to the same perch to sunbathe at certain times of the day. Males are regularly encountered puddling along damp forest paths and sandy streambanks. 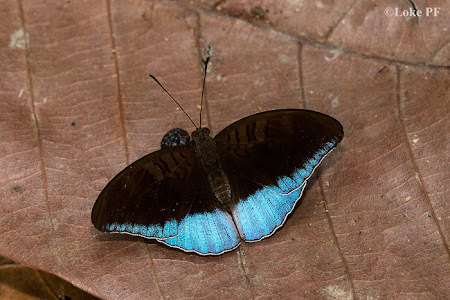 The male is shining blue on the upperside with a narrow black marginal border. 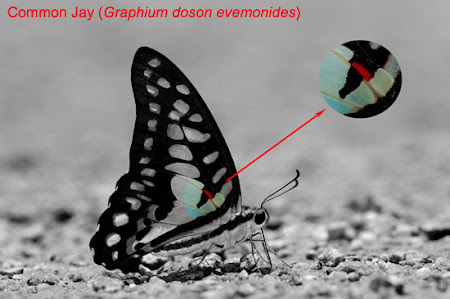 The female is pale greenish blue with broad black borders on both wings. The underside is a pale grey with a variety of streaks and spots. 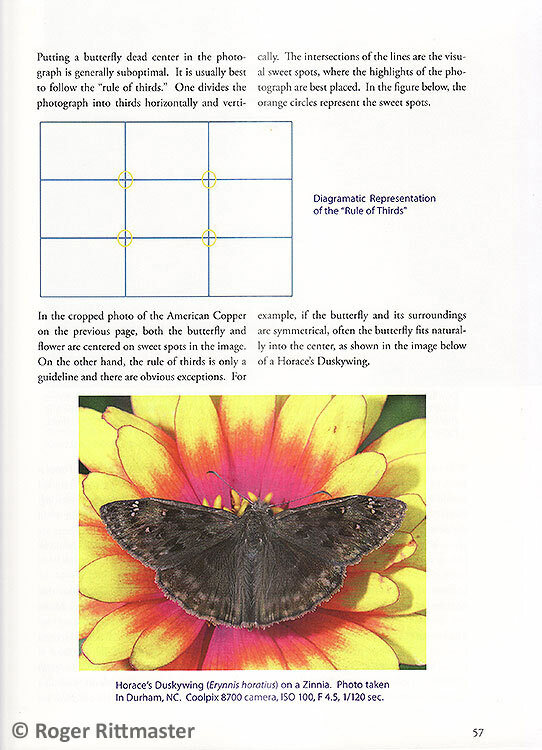 The markings can be quite variable, as described in an earlier article on this blog. This individual was photographed puddling by ButterflyCircle member Chng CK last weekend. 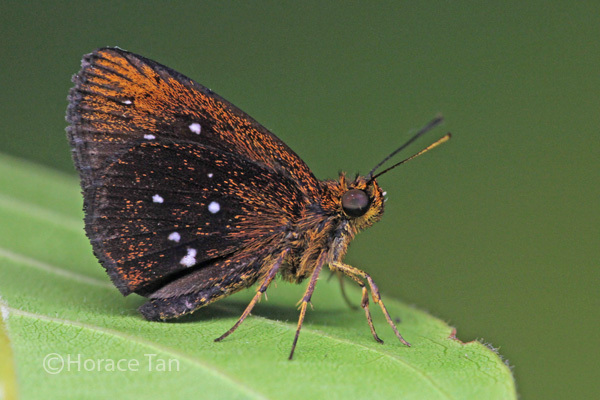 This fast-flying "Flash" is one of six species of the genus Rapala that is currently extant in Singapore. The Suffused Flash has a wide distribution, and can be found in urban parks, forested areas and back-mangrove habitats in Singapore. The male is orange-red above with broad black borders, whilst the female is a drab brown and unmarked. The underside is ochreous to pale buff brown, but can be distinctly yellow in some females. The species is moderately common and in its preferred habitats, several individuals have been observed together e.g. 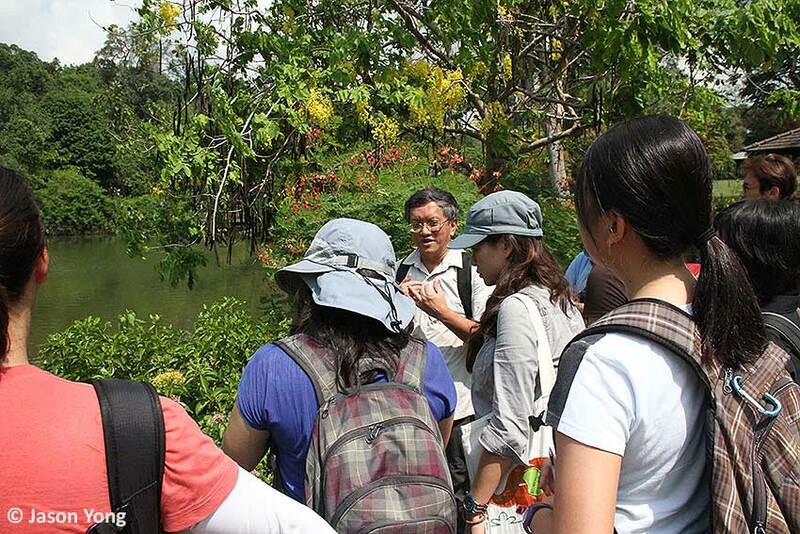 Sg Buloh Wetland Reserve. Amongst the host plants that its caterpillars feed on are Talipariti tiliaceum (Sea Hibiscus) and Falcataria moluccana (Albizia). Its early stages have been recorded here. 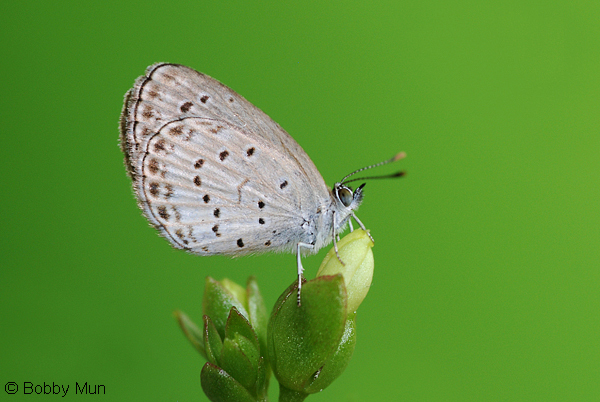 This female Suffused Flash was shot by ButterflyCircle member Sunny Chir. 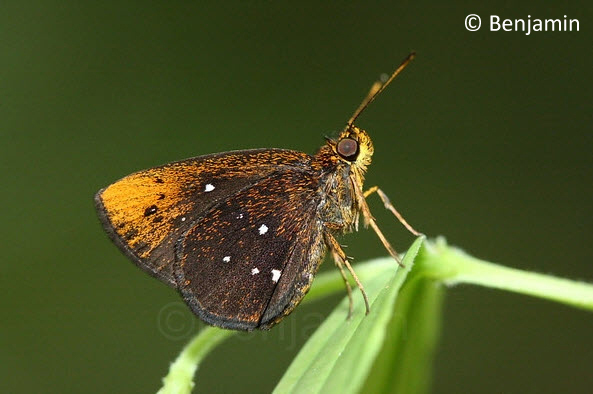 This predominantly brown and rather drab skipper is one of many lookalikes amongst the Hesperiidae family that is frustrating to identify in the field. 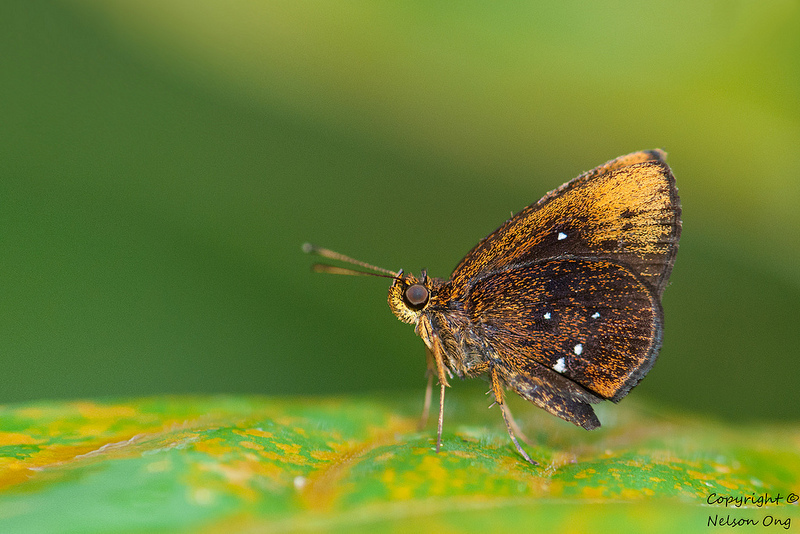 Skippers are often mistaken to be moths by the general public, and understandably so, due to these butterflies' large eyes, fat bodies and usually unattractive colours. In Singapore, there are likely to be more species that will be added to the checklist as research continues into their early stages and other aspects of distinguishing the many similar-looking butterflies. 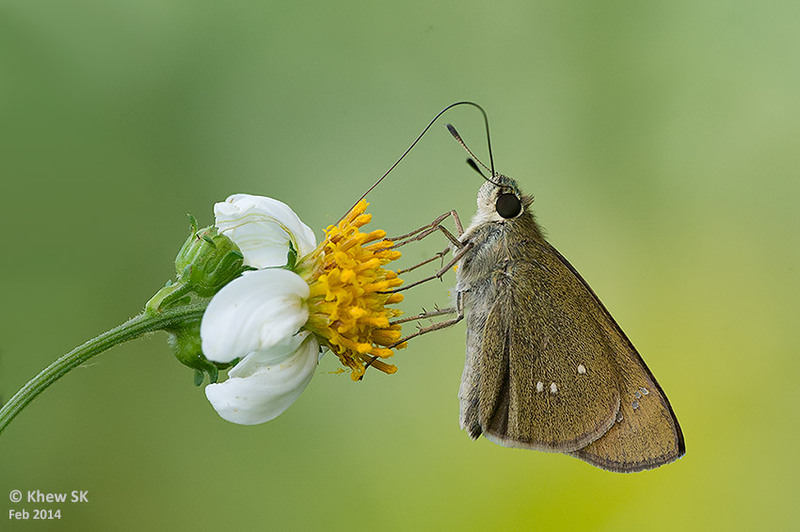 This Formosan Swift was shot in the early morning hours whilst it was busy feeding on the flowers of Bidens pilosa, a wild-growing weed in wastelands. 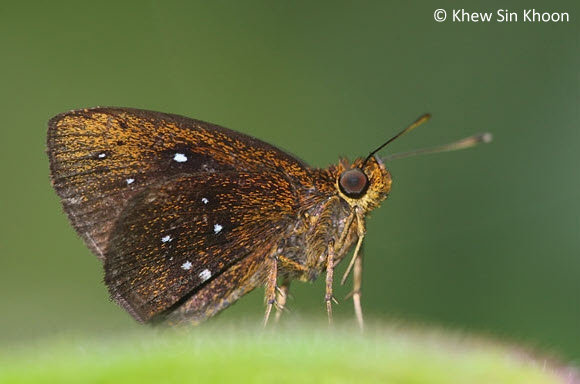 The typical colouration of this skipper, light brown with a slight greenish scaling, and the absence of a cell spot on the hindwing below, sets it apart from its close cousins in the Pelopidas and Polytremis genera. 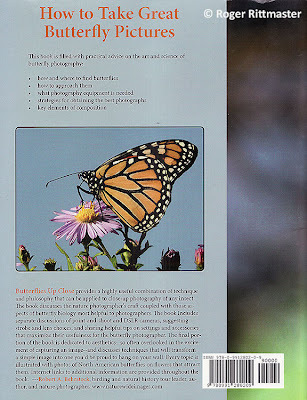 The butterfly is relatively common in urban areas, but can also be found in the forested fringes of our nature reserves.